The Israeli military’s Arabic-speaking spokesperson, Lt. Col. Avichay Adraee, repeats in almost all of his tweets and interviews with Al-Jazeera that Gazans would be better off if they staged a coup and overthrew our Hamas-led government. Judging from the media coverage, most people outside of Gaza believe Israeli claims that our suffering is Hamas’ fault. But while many of us are critics of our government, we always will consider the Israeli government most responsible. My story explains why. I was born in Khan Younis, in the southern Gaza Strip, in 1993. That same year, my parents and I moved to the United Arab Emirates. My dad had traveled to the UAE when he was 18 to find a better job but returned at his mother’s insistence to marry a Gazan—my mother. He took the three of us back as soon as he could. While I may have grown up in the UAE, I was raised to love the land of my birth. Gaza has always been in my heart. Still…the terrifying news I read in the media of Israel’s crimes against my people frightened me. I loved Gaza but was scared to visit it. My parents, however, increasingly yearned to return. Thus, they decided in 2004—10 years after leaving—to visit their families Gaza once again. My mother’s father died while she was gone; I was too young to really remember it, but her tears are burned into my earliest memories. At that time, Israel still had a physical presence in Gaza—8,000 settlers guarded by soldiers. Still, my parents spoke of it like it was a paradise. When we arrived, I was a 12-year-old boy. To reach Gaza is an ordeal—a 2,905-kilometer plane trip from the UAE to Cairo (Gaza is not allowed to operate its own airport), then a taxi ride of about 319 km to my new home. At the Rafah crossing into Gaza, I saw the beginning of a ghetto: Two watchtowers rose above the sandy road at each side, sheltering Israeli snipers. The narrow road ended at a prison-like gate and we were forced into it with a crowd of others. “Hold your daughter’s hand; don’t let her run away, and stay behind me,” my father instructed my mom. Then, he grabbed my hand so hard it hurt. The snipers fired around us, near the ground, to scare us into a shivering straight line. Sand from the bullets flew everywhere. We terrified of making a wrong move that would end in us being shot dead. Periodically, a Palestinian was forcibly removed a from the queue by a well-armed soldier. I didn’t know what was happening to them until we walked another few meters and glimpsed a glass-walled room on our left where the men were being stripped and searched. I don’t remember how long we stood under the blazing sun, while being prevented from sitting down for rest. Many of the women and children fainted. But it was at least six hours. At last, we reached an air-conditioned building. We had completed all of the humiliating procedures and entered Gaza, where my uncles waited with open arms to take us to our home for the next month. We rode in my uncle’s ancient car the building that would be our house. On our way, I observed two completely different worlds, with my uncle acting as tour guide. 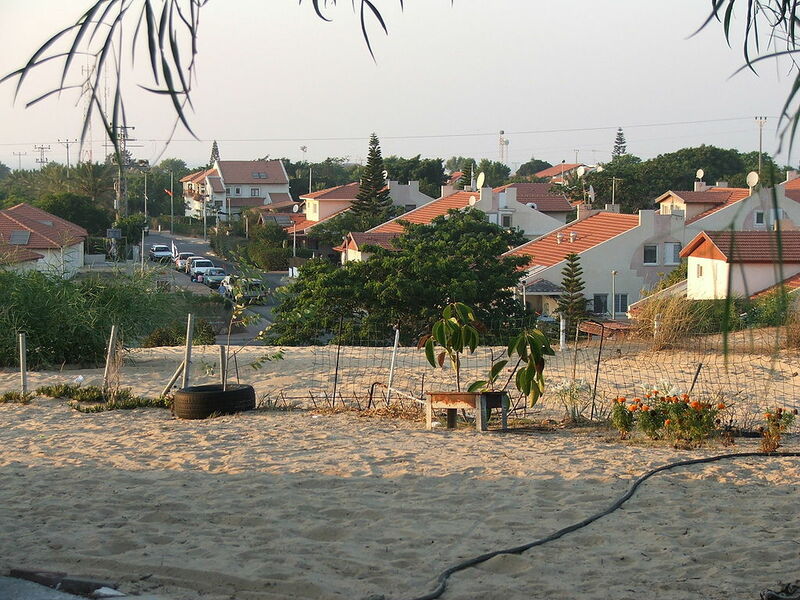 “To your left on the west, you will see the green land with the Israeli settlements near the Gaza beach. We are not allowed to visit there. No Palestinian is. If you go to the west, you’ll be among the dead,” he explained bluntly. As a child, I imagined the settlements as fancy palaces, a literal paradise. I was never allowed to actually see them. To the east were the crumbling Palestinian houses. I noticed they were pockmarked with tiny holes and asked my uncle about them. “They are caused by the shooting of Israeli snipers from their watchtowers,” he responded matter of factly. This sounded terribly frightening to me. Noticing, my father interrupted the conversation by asking about my grandmother. Finally, we reached home. After an hour of emotional family reunion, we sat together on the ground floor.Palestinians houses in Gaza are usually three to six stories high. Each floor is allocated to one of the grandparents' sons and his family. The ground floor is for the grandparents. Every day, all of the family members gather together for long conversations. However, I was warned not to go upstairs to my room, except when I wanted to sleep, and even then, I must only do so by crawling. At first, this sounded strange and a bit silly to me. Then I noticed the tiny holes in our own wall and I realized what this was all about. I also noticed that the window of my room looked out to the west. “The westis where the Israeli settlements are, right?” I asked. My grandmother continued with her safety instructions: Stay away from the western side of the house and its windows as much as you can. Don’t go outside alone. Whenever there’s a curfew, we all stay together at the ground floor. The instructions went on for a very long time.I wished this nightmare would end and I would be back in the UAE, where I could tell my friends about the horror I had escaped. A month later, when I had just started adjusting, our visit ended and we returned to our other world, the UAE. In the UAE, I completed elementary and secondary school. My dream was to become an architectural engineer but the year I graduated, I learned my father wouldn’t be able to cover my university fees. I tried, fruitlessly, to find a job to pay for the costs, but failed. My only choice seemed to be to return to my homeland, the land of my childhood nightmare. By the way, Emirates study at university for free. It’s only transplants like us who must pay—to the tune of about 20,000 AED, or about 5,500 USD, each semester. Sadly, my Palestinian father, who worked almost 20 years doing public relations for a UAE company, barely earned a quarter of that amount each month. Returning to Gaza was my future. “In this world, if you don’t have a university certificate, you’ll spend the rest of your life unemployed,” my family insisted. So, I traveled back. It was 2010. Gaza had already experienced the first of three Israeli assaults, which killed more than 1,400 Palestinians. I convinced myself that it would be only four years and then I’d escape again. But now, it’s 2018, two more assaults have occurred, and I’m still here. For the first two years, it was just me; today, the rest of my family—my two parents, two sisters and brother—have joined me. Only my youngest sister still talks of leaving. As the years passed, I have become a Gazan again. Yes, that means being terrorized, oppressed, dehumanized and besieged. But I won’t flee again.Instead of studying architecture, Ilearned English, chasing another dream of reaching the outside world through my writing—hoping that one day, the humanitarian side of the civilized world will end what I now embrace as our sufferingin Gaza. Gaza has always been in my heart. But now Gaza is my life. I am Gaza.